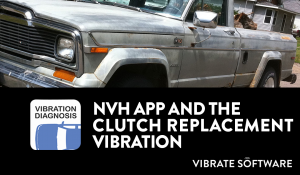 NVH App and the Clutch Replacement Vibration - Vibrate Software, Inc. While listening to the service manager describe the history of this vehicle, I learned that shortly after the truck was sold, the customer came back to the dealership with a slipping clutch. The owner of the had purchased an extended warranty policy, so the clutch and pressure plate replacement was covered under this warranty. The clutch was replaced with aftermarket parts, not factory original parts. It was after the clutch replacement that the vibration began. The technician that had replaced the clutch decided that the aftermarket clutch must be a bad one, so they replaced it with a factory original clutch disk, flywheel, pressure plate, and release bearing. The vibration was still present after replacing all of those parts. The technician who had replaced the clutch had determined that the vibration was related to engine speed and could be duplicated with or without driving the vehicle. Somehow logic left the room at this point; the technician decided that the V-6 engine must be bad, so they replaced the engine under the customer’s extended warranty. As you may have guessed, the vibration was still there after replacing the engine! That is when I received the call for help. Using the same diagnostic procedure outlined in our new NVH smartphone app, the technician who had been working on the truck and I performed a quick road test of the Truck. The results of the road test indicated that the vehicle had a second order engine speed related vibration. As the NVH app’s own diagnostic help file indicates, second order engine speed related vibrations are normal on V-6 engines, however they should not be felt in the passenger compartment. Since the vibrations were being felt in the passenger compartment, the vibrations must be transferring from the engine to the passenger compartment somehow. The NVH app’s help file indicates that the vibration only transfer through a few select parts on the vehicle. Any other part that touches both the engine and the body of the vehicle. The technician and I started working our way down this list of items to check, but we could not find any problem with any of the items. We checked each mount to make sure it was damping the vibration amplitude as it should; they were were good. I was thinking to myself “This truck is not going to be as easy to diagnose as I thought”. Just as I was getting a little frustrated, I looked up at the driveline. This is a rear-wheel drive truck with a two piece driveline. The front driveshaft has a slip yoke where it slips into the rear of the manual transmission, a rubber mounted center support bearing, another slip yoke, and the rear driveshaft. I noticed that the center support bearing bracket was slid forward farther than it was out of the factory. There was a clean spot on the bracket where the bolts had been previously. The center support bracket has oblong holes to allow the center support bearing to adjusted forward or backward about an inch when installing the driveline. I then looked at the front slip yoke and noticed that it was jammed all the way into the back of the transmission, there was no allowance for slip as it should have. I also noticed that the rubber portion of the rubber mounted center support bearing was bowing back towards the rear of the truck. Suddenly I realized that the driveline and center support bearing/bracket was the transfer path for the normal engine vibrations to transfer into the passenger compartment by bypassing the engine and transmission mounts! We loosened the center support bearing bracket bolts, slid it back to the same position it was when it came out of the factory. This allowed the slip yoke to have some slip. We drove the vehicle again and the vibration problem was gone! I added driveshaft slip yoke to the list of causes for transferring normal vibrations into the passenger compartment after this experience. The cause of the vibration was the technician slamming the driveline slip yoke all the way into the back of the transmission after replacing the clutch the first time. The technician did not allow for slip in the slip yoke. Thousands of dollars in parts and many hours were wasted trying to fix this vibration. All of this could have been avoided had the technician or the dealership had a vibration diagnostic tool like the NVH app that is quick and easy to use.